The gate lodge. The gate is set back to create more space on a narrow pavement and the verandah above with views down onto the gate but also with views to the lake gives this the feeling of a gazebo or garden building in the park of a great house. In this series of posts about modern cladding, Bordings Independent School by the architectural studio of Dorte Mandrup might appear to be an odd building to include. Completed in 2008, the new addition to existing school buildings is a relatively conventional design using reclaimed brick for its long north and south walls and with glazed ends to bring light into what are ostensibly large open spaces on two main floors but also with a large basement space. Although the east end of the building, with a broad flight of steps down to the basement looks into the narrow courtyard of the school, the west end faces onto the pavement and traffic of Øster Søgade, with views across the road to trees and the lake of Sortedams Sø beyond. With what are actually glass walls at each end of the new block, and with undivided spaces, so no cross walls, there are views through from the north-facing courtyard to the trees and the lake to make the courtyard as open and as light as possible. The new building is against the north boundary of the plot and is set parallel to an earlier brick-built gymnasium to the south and the gap between the two is a main entrance into the school courtyard. Across the end of the range, and also forming school gates, is a steel structure covered in sheets of Corten pierced with tightly-spaced holes to create a screen. This provides privacy for pupils inside, so people walking by on the pavement see less clearly what is happening inside the building, but during the day, particularly in brighter sunlight, the screen is relatively transparent, and lets through light and allows a view out to the trees along the lake edge and the water of the lake. At night the visual effect reverses with the interior revealed by internal lighting. In effect, the structure is part screen, part verandah, part summerhouse grotto and part factory gate. Corten steel is now quite widely used in buildings and garden designs. With its deep rust colour, it is generally a good foil for green planting but also has a curious ambiguity that makes it both hard and industrial, so starkly modern, but at the same time somehow natural and less mechanical than plastics or fibre glass or even coloured glass. Pierced metal sheets have been used in several buildings in the city to disguise car parking … the most obvious examples being the metal sheeting, laser cut with holes to depict a landscape of mountains, that covers car parking below apartments in Ørestad, The Mountain by BIG and JDS from 2008, and, most recently, pierced metal sheet has been used for the outer facing of Parking House Lüders by jaja architects, a multi-storey car park in Nordhaven. There, the design on the metal sheet includes figures from the history of the docks. At both The Mountain and Parking House, the holes cut through the metal are more widely or more closely spaced to create the impression of lines and areas of tone or shadow like pixels on a traditional print image in a newspaper. 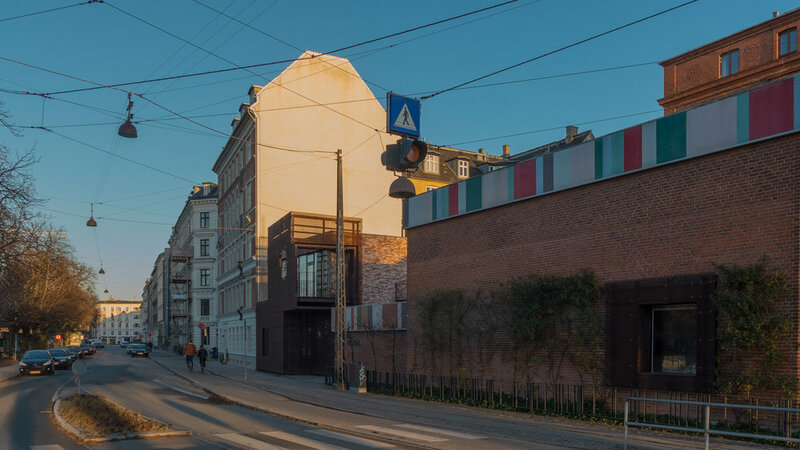 Architects in the city have also used pierced metal sheet for blinds or shutters to provide privacy … perhaps most notably for the remodelling of the offices at Toldbodgade 13 by BBP Arkitekter. But curiously, at Bordings School, the use of Corten, particular in such stark bold block shapes seems almost aggressive … almost too industrial for school children. That is not actually a criticism because this is one of the most stimulating and interesting modern buildings in the city … and for a city of outstanding modern architecture that is quite something. The symbolism implied here is complicated. For a start, what is a school if not a sort of factory so why not factory gates and the severity does suggest security or protection. Corten steel has been used in the entrance gateway of the new UN building in Nordhavn for similar reasons. The design of Bordings School is challenging - it is curious and unique architecture - so one good way to get children talking about and thinking about design. Also the building, or rather the frontage to the street, had to be bold to compete with the much more substantial flanking buildings against which it has a relatively small scale. It must have been a challenging brief and certainly in terms of its role in the townscape it would form an interesting example for planning students to discuss if they were asked to assess how it fits into the complex site and a sensitive and demanding streetscape. For a start there are clever ideas like setting the gates back from the pavement to create an area for vehicles turning in off the road if the gates are shut and as an area where parents and children can congregate to wait or to talk … a sort of interim space between public street and private school. 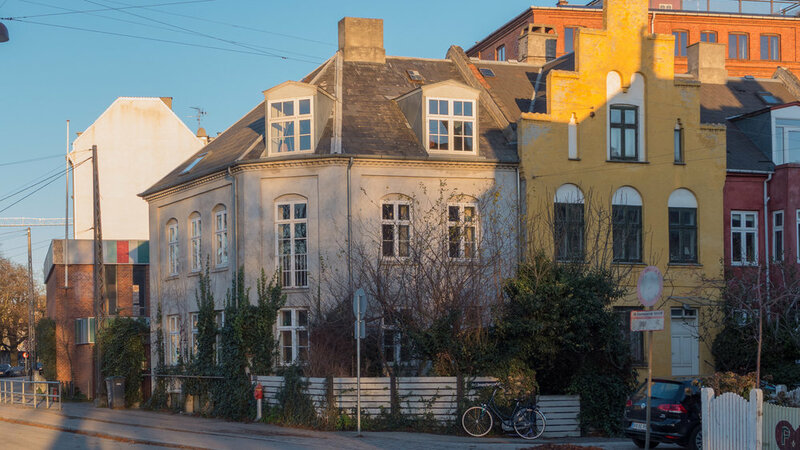 The school is at a hinge point, a change of angle in the road and the lake, but there is a also a distinct change at this point in the architecture of Øster Sogade with traditional Copenhagen apartment buildings immediately to the north, continuing all the way to Østerbrogade - here, immediately next to the school, with a classically inspired frontage of five storeys but with a high blank gable end towards the school - and to the south, after the gable end of the earlier flat-roofed gymnasium, there are the gable ends of the houses of the series of roads that run back from the lake … the important and famous Potato Rows or Building Society Row Houses dating from the 1870s and 1880s. Approaching the school from the south along Øster Søgade with the Potato Houses to the right and the lake to the left. The earlier tall brick main school building can be seen first above the houses and then the sports hall added to the left with the first glimpse of the new building. Finally the building by Dorte Mandrup can be seen against the high gable of the apartment building immediately to its north. This is also where the screen of iron standing forward of the building has a significant function … the block of the new building runs along the north boundary of the plot with square-set end walls - in terms of construction the cheapest and easiest solution - but that leaves an odd triangle of space against the pavement so the iron structure disguises that change of alignment. 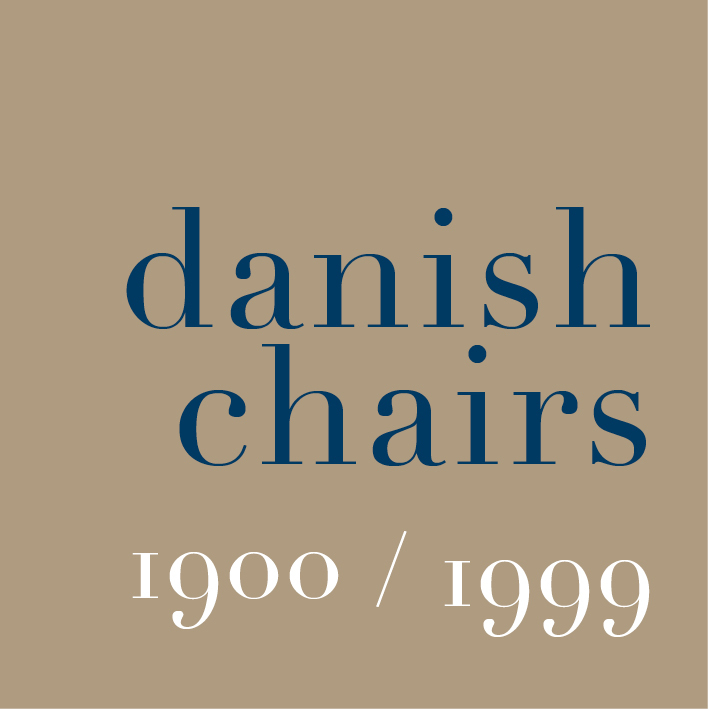 This site also illustrates well a more general problem in Copenhagen … and in fact a problem for any new development in densely built cities particularly where there is a mixture of buildings of different sizes and different ages. If you punch a hole or have a break in the streetscape then the sight lines through the site and the backdrop of new buildings are much more difficult to control and you expose the backs of buildings that were not built to be seen. 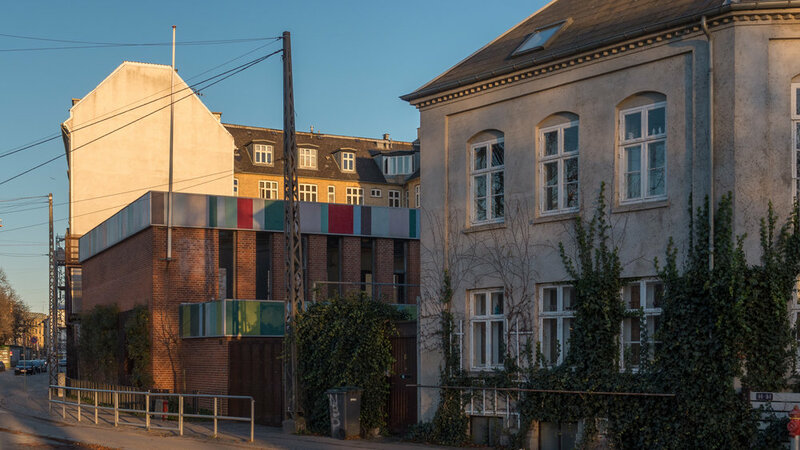 Here the wide gap in the Øster Søgade frontage opens up views to the back and into the courtyard of the apartments to the north and east. The new building for the school would have to be much taller to screen the courtyard but then would have created shade in the courtyard in the afternoon. The arrangement of the sheets of Corten creates a series of simple box shapes with no clear vertical or horizontal articulation though possibly here at this point in the street just slightly more height and more vertical emphasis could have created a stronger mark on the street scape although again this raises the interesting problem of the changing dynamics of the building visually which is very different for the person walking along the pavement hard against the building to the view for people walking along the side of the lake and the impact of the building is very different if you are walking from south to north when the gates and the verandah above have greatest impact, because they face you, which is very different to seeing the building as you walk from the north when the front is angled back and not visible until you are standing beside it. A window into the sports hall has been given a frame of Corten to form a visual link between the two blocks.